Figure 2-3. 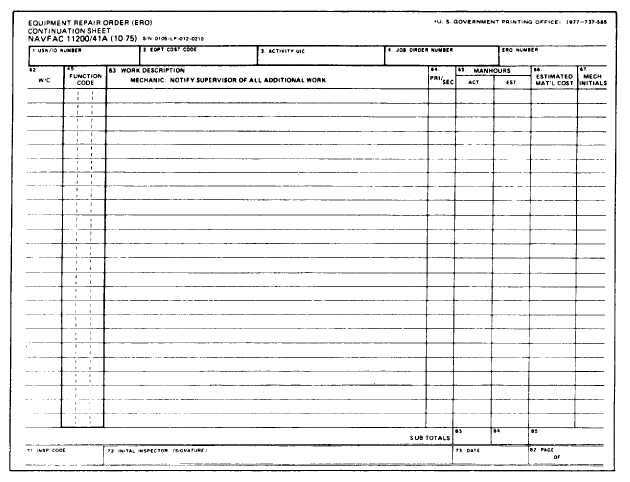 - Equipment Repair Order Continuation Sheet, NAVFAC 11200/41A. serviceable condition at a minimum cost and to inspection and as a trouble report in case of any detect and correct minor deficiencies before they lead to costly repairs. The CESE Maintenance System of the NCF and special operating units (SOU) has three categories of maintenance: (1) organizational, (2) intermediate, and (3) depot. The first, or organizational, level of maintenance is divided into two categories: operator maintenance and preventive maintenance (PM). Operator maintenance, sometimes called first-echelon maintenance, is the maintenance that every operator is required to do to maintain CESE in a clean, safe, and serviceable condition. It includes daily inspections, lubrications, and adjustments necessary to ensure early detection of malfunctions of CESE. Figures 2-11 and 2-12 show preventive maintenance forms that the operator can use as guides for a daily prestart defect or unsafe condition that needs to be reported to the dispatcher immediately. The second part of organizational maintenance is preventive maintenance, which goes beyond the inspections, lubrications, and adjustments of operator maintenance. Its prime objective is to maximize equipment availability and to minimize unnecessary repair costs. Whenever feasible, operators should participate in this type of maintenance.